Scholar of the tenth century and pioneer of scientific study among Arabic-speaking Jews. His Arabic name was "Abu Sahl"; his surname, according to an isolated statement of Moses ibn Ezra, was "Al-Shafalgi," perhaps after his (unknown) birthplace. The name "Dunash," for which Abraham ibn Ezra substitutes the Hebrew "Adonim," is probably derived from the Latin "dominus," and not from the Arabian "dhu nas" (lord of mankind), concerning which there is nothing to show that it was used as a proper name. The name seems to have been native to North Africa; the younger contemporary of Ibn Tamim, Dunash ibn Labraṭ, for instance, was born in Fez (see Steinschneider, "Cat. Bodl." col. 897; "Jew. Quart. Rev." x. 519; J. Derenbourg, "Opuscules et Traités d'Aboul-Walid," p. 2). Hence the statement of Abraham ibn Ezra to the effect that Ibn Tamim came from the East—to be more exact, from Babylonia, or Bagdad (on one occasion he calls him Mizraḥi, on another Babli)—does not deserve consideration beside that of Moses ibn Ezra, who calls him a native of Kairwan. The statement of Ibn Ezra has been interpreted as signifying that the family of Ibn Tamim came from Bagdad; but it is possible that Abraham ibn Ezra has erroneously transferred the appellation "Babylonian" from Ibn Labraṭ to Ibn Tamim. The additional details concerning Ibn Tamim's life and activities have been gathered principally from his Yeẓirah commentary discussed below. In this commentary, which was written in the year 955-956, Saadia the Gaon is mentioned as no longer living. 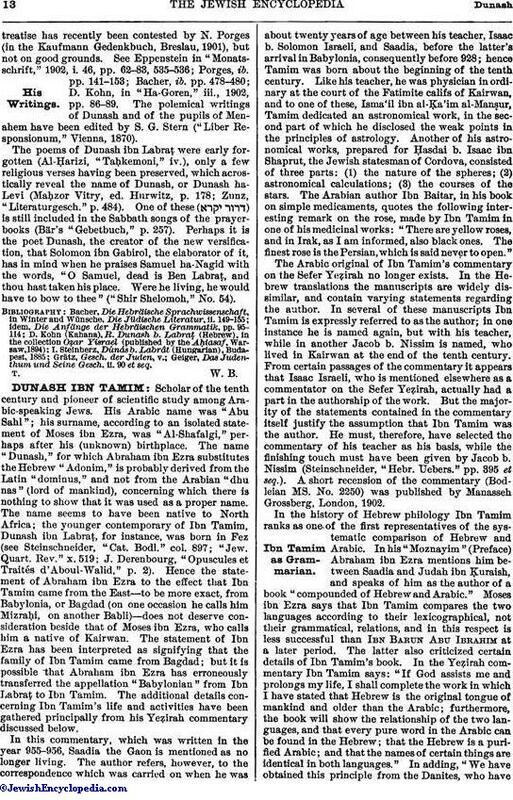 The author refers, however, to the correspondence which was carried on when he was about twenty years of age between his teacher, Isaac b. Solomon Israeli, and Saadia, before the latter's arrival in Babylonia, consequently before 928; hence Tamim was born about the beginning of the tenth century. Like his teacher, he was physician in ordinary at the court of the Fatimite califs of Kairwan, and to one of these, Isma'il ibn al-Ḳa'im al-Manṣur, Tamim dedicated an astronomical work, in the second part of which he disclosed the weak points in the principles of astrology. Another of his astronomical works, prepared for Ḥasdai b. Isaac ibn Shaprut, the Jewish statesman of Cordova, consisted of three parts: (1) the nature of the spheres; (2) astronomical calculations; (3) the courses of the stars. The Arabian author Ibn Baitar, in his book on simple medicaments, quotes the following interesting remark on the rose, made by Ibn Tamim in one of his medicinal works: "There are yellow roses, and in Irak, as I am informed, also black ones. The finest rose is the Persian, which is said never to open." The Arabic original of Ibn Tamim's commentary on the Sefer Yeẓirah no longer exists. In the Hebrew translations the manuscripts are widely dissimilar, and contain varying statements regarding the author. In several of these manuscripts Ibn Tamim is expressly referred to as the author; in one instance he is named again, but with his teacher, while in another Jacob b. Nissim is named, who lived in Kairwan at the end of the tenth century. From certain passages of the commentary it appears that Isaac Israeli, who is mentioned elsewhere as a commentator on the Sefer Yeẓirah, actually had a part in the authorship of the work. But the majority of the statements contained in the commentary itself justify the assumption that Ibn Tamim was the author. 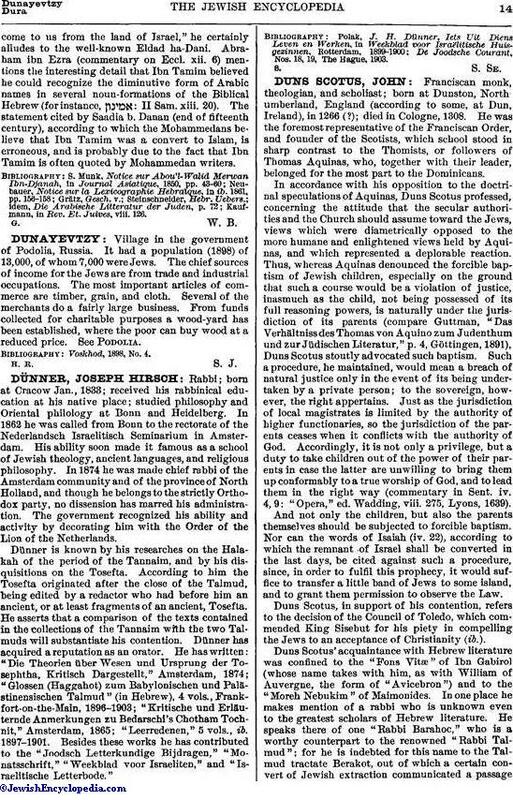 He must, therefore, have selected the commentary of his teacher as his basis, while the finishing touch must have been given by Jacob b. Nissim (Steinschneider, "Hebr. Uebers." pp. 395 et seq.). A short recension of the commentary (Bodleian MS. No. 2250) was published by Manasseh Grossberg, London, 1902. In the history of Hebrew philology Ibn Tamim ranks as one of the first representatives of the systematic comparison of Hebrew and Arabic. In his "Moznayim" (Preface) Abraham ibn Ezra mentions him between Saadia and Judah ibn Ḳuraish, and speaks of him as the author of a book "compounded of Hebrew and Arabic." Moses ibn Ezra says that Ibn Tamim compares the two languages according to their lexicographical, not their grammatical, relations, and in this respect is less successful than Ibn Barun Abu Ibrahim at a later period. The latter also criticized certain details of Ibn Tamim's book. In the Yeẓirah commentary Ibn Tamim says: "If God assists me and prolongs my life, I shall complete the work in which I have stated that Hebrew is the original tongue of mankind and older than the Arabic; furthermore, the book will show the relationship of the two languages, and that every pure word in the Arabic can be found in the Hebrew; that the Hebrew is a purified Arabic; and that the names of certain things are identical in both languages." In adding, "We have obtained this principle from the Danites, who havecome to us from the land of Israel," he certainly alludes to the well-known Eldad ha-Dani. Abraham ibn Ezra (commentary on Eccl. xii. 6) mentions the interesting detail that Ibn Tamim believed he could recognize the diminutive form of Arabic names in several noun-formations of the Biblical Hebrew (for instance, : II Sam. xiii. 20). The statement cited by Saadia b. Danan (end of fifteenth century), according to which the Mohammedans believe that Ibn Tamim was a convert to Islam, is erroneous, and is probably due to the fact that Ibn Tamim is often quoted by Mohammedan writers. Kaufmann, in Rev. Et. Juives, viii. 126.